Topics Covered – China’s Xinjiang province and unrest, Islamic State tactics, AQAP, MARSOC bonuses, ‘Battlefield Airmen’, can 180As really run, death by PowerPoint, Gen (Ret) Keane on Afghanistan, organizing CA under USSOCOM, defending Gotland, Uganda SFQC, MAVNI program, new national CT strategy, al-Shabaab, Montagnards, females in Afghan NMUs, and more. Paper on Civil Affairs Organizational Structure. A detailed paper provides information and a recommendation for a change in organizational structure of the Civil Affairs Regiment to take place at USSOCOM. Read the thoughts of an officer and NCO of the 96th Civil Affairs Battalion (Special Operations) in “The Future of Civil Affairs: Creating Regimental Order from Chaos”, Small Wars Journal, October 12, 2018. New Bonuses for MARSOC. 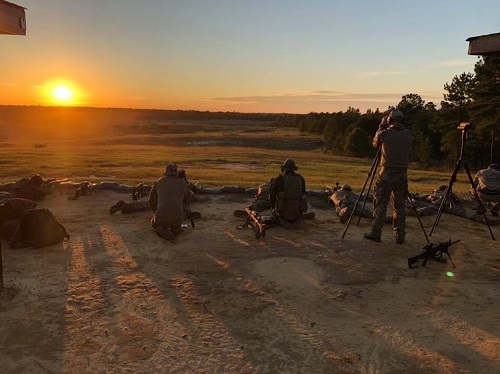 Critical skill operators with the Marine Raiders who are E-7 and above can net a $50,000 bonus with a four-year reenlistment. It is part of the Critical Skill Retention Bonus (CRSB) program. See “New bonuses target senior Marine special operators”, Marine Corps Times, October 12, 2018. Revamping ‘Battlefield Airmen’. The Air Force is reorganizing its elite ground forces. Pararescuemen and combat rescue officers – now under Air Combat Command – will move into special tactics squadrons. This will allow them to work alongside combat controllers and special operations weather team members who fall under AFSOC. (Air Force Times, Oct 12, 2018). Uganda SFQC. A news article about the Uganda People’s Defence Forces Special Forces Command training to qualify members of the Special Forces. (SoftPower News, Oct 14, 2018). Do SOF CW5s Really PT? It would seem at least four of them do. A team of runners from USASOC (Jeff Burmeister, David Holton, Stephen Dayspring, ad Dennis Castelanos) placed first in the “Chief Warrant Officer 5 Division” (old man’s division?) 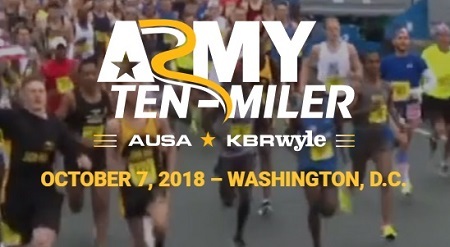 in the Army’s Ten Miler held on October 7th in Washington, D.C.
EOD Soldiers Awarded Medals. Members of the 28th Explosive Ordnance Company based at FBNC were recognized for their meritorious and valorous achievements during a recent ceremony. The 28th EOD has deployed with JSOC and the Ranger Regiment many times over the past several years. (The Fayetteville Observer, Oct 11, 2018). Female Afghan SOF Getting New Facilities. The Afghan National Defense and Security Forces (ANDSF) has had a slow start in the integration of women into the security institutions and organizations. However, the Afghan Special Security Forces (ASSF) seem to be having some success – at least according to the PAO office of NATO Special Operations Component Command – Afghanistan (NSOCC-A). The General Command of Police Special Units (GCPSU) commando forces are establishing or female dormitories and facilities at the locations of the Ministry of Interior’s (MoI) National Mission Units – CRU 222, CF 333, ATF 444, ATF 555, ATF 888, and ATF 999. Read more in an article published by NSOCC-A on DVIDS on October 9, 2018. Speaker of House Ryan Visits ANASOC. Paul Ryan and the Chairman of the House Armed Services Committee – William Thornberry – recently paid a visit to the Afghanistan National Army Special Operations Command School of Excellence near Kabul. (NSOCC-A DVIDS, Oct 10, 2018). The 18th Annual International Sniper Competition starts on Monday, October 15, 2018. 30 teams are competing. Competition runs 14-19 October. MAVNI Program – In State of Flux. During the Cold War (especially the 1950s) U.S. Army Special Forces had the luxury of Eastern Europe citizens who joined the Army, went to SF, and offered up their native language skills to the 10th Special Forces (and other groups as well) that was geared up to conduct intelligence and unconventional warfare in a Russian-occupied Europe. The Lodge Act – which authorized the accessions process into the military – was a boon for the cultural and language expertise of SF (there was some reluctance on the part of ‘big Army’ to The Lodge Act). The Military Accessions Vital to the National Interest (MAVNI) is supposed to operate in a similar fashion but there has been some roadblocks. Read “Army expelled 500 immigrant recruits in 1 year”, Army Times, October 12, 2018. Paper – China and Xinjiang. Ketan Mehta argues that a primary reason for the Silk Road Economic Belt (SREB) being advanced by China is the ethnic unrest in Xinjiang. It is hoped (by China) that the economic development strategy will improve the economic conditions in the province – and diminish the resistance to the regime. Read Locating Xinjiang in China’s Eurasian Ambitions, Observer Research Foundation (ORF), September 25, 2018. 17 F-22’s Damaged. Hurricane Michael may have damaged or destroyed as many as 17 jet fighters at Tyndall AFB. That’s quite a lot of money down the drain. I am thinking the Air Force will change up basing locations in the future – or maybe harden some hangers. Reports by the Air Force say that damage is not as great as initially thought. Afghanistan – CSTC-A CoC. LTG James Rainey took command of the Combined Security Transition Command – Afghanistan during a change of command ceremony in Kabul on October 12, 2018. Islamic State. Analysts say that Islamic State group has reverted back to its pre-2014 tactics – adopting the methodology of an insurgent network that targets government and civilian targets with guerrilla and terrorist style attacks in attempt to incite sectarian strife. Hmmm. No surprise there. See “IS reverting to insurgency tactics after losing caliphate”, AP, October 12, 2018. “M.B.S.” now has a new meaning. Mister Bone Saw. Al-Qaeda in Arabian Peninsular. Gregory Johnsen, a resident scholar at the Arabia Foundation and book author, examines al-Qaeda in the Arabian Peninsular (AQAP) and finds there are two strands – the domestic insurgency and the international terrorist organization. He says the group is now primarily focused on the domestic insurgency (Yemen) and less on international terrorism. He offers some perspective on what to do next in “The Two Faces of al-Qaeda in the Arabian peninsular”, War on the Rocks, October 11, 2018. Russia’s Infowar. Counter propaganda techniques are reactionary and ineffective. The ability to counter Russia’s disinformation activities requires “. . . focus, engagement, and new thinking.” Radu Magdin, a strategic communications analyst and consultant, offers a way forward in “How to Fight Russian Infowar in Central Europe”, Defense One, October 12, 2018. Defending Cap of the North. Jonny Lindfors, a colonel in the Swedish Army, writes about the importance of defending the North Cape, Gotland, and the Cap of the North. See how Russia’s intentions pose difficulties for the Nordic nations in “Gotland: A Nordic Defense Dilemma“, War Room, U.S. Army War College, October 12, 2018. How the Soviets Planned for Conquering West Europe. Zachary Keck, the former managing editor of The National Interest, “Russia’s Plan to Invade and Crush NATO in a War Would Have Killed Millions”dives into Cold War history and lays out how the Soviet Bloc would have conquered Western Europe through a combination of nuclear weapons and conventional forces. Read , The National Interest, October 12, 2018. Mattis Visits Vietnam. SECDEF Mattis visited Vietnam to meet with key leaders to reaffirm defense relationships and conduct bilateral and trilateral meetings with senior officials. Then he heads to Singapore to participate in the Association of Southeast Asian Nations Defence Minister’s Meeting. The Montagnard’s Plight. During the Vietnam War U.S. Army Special Forces teams provided training and weapons to Montagnard militias in the Central Highlands to disrupt the infiltration of North Vietnamese troops and supplies into South Vietnam and to secure areas of the Central Highlands. The Montagnards lost more than 250,000 men during this conflict. In 1975 at the end of the war some become refugees (many going to Thailand), some died, and some spent time in re-education camps. Read more about the current situation of the Montagnards in an article by Dan Southerland – former executive director of Radio Free Asia – in “Say a prayer for Vietnam’s forgotten Montagnards”, Asia Times, October 13, 2018. Strife in Burkina Faso. The French Barkhane anti-terror force currently deployed in West and Central Africa is now seeing action in Burkina Faso. This is a new employment of the force that is trying to contain the jihadist threat in the region. (Yahoo! News, Oct 11, 2018). Al-Shabaab in Mozambique? Jamine Opperman, formerly of the South African National Intelligence Agency (NIA), examines al-Shabaab’s engagement and influence in Mozambique. She explores whether the terrorist / insurgent organization is expanding beyond its traditional area of operations (Somalia and Kenya) in Has al-Shabaab Officially Announced Itself in Mozambique?, Islamic Theology of Counter Terrorism, October 13, 2018. CTC Sentinel. The October 2018 issue of the CTC Sentinel published by the Combating Terrorism Center at West Point is now available online. How to Avoid Death by PowerPoint, Tedx Talks, April 2014, 20 mins. The Untold Story of General Jack Keane, Fox News, October 11, 2018, 6 mins. General (Ret) Keane recounts a personal story about a series of trips to an Afghan village and why the villagers resist the Taliban. Could You Be the Next Best Warrior, US Army, October 12, 2018, 2 minutes. 22 of the Army’s finest warriors representing 11 commands compete in this competition. 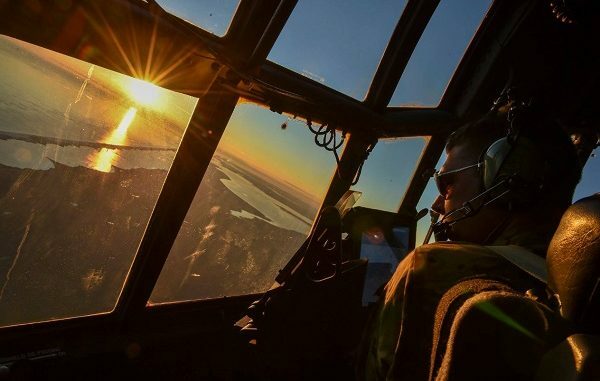 Photo: A C-130 from the 1st Special Operations Wing at Eglin AFB participates in Exercise Frigid Archer in 2016.